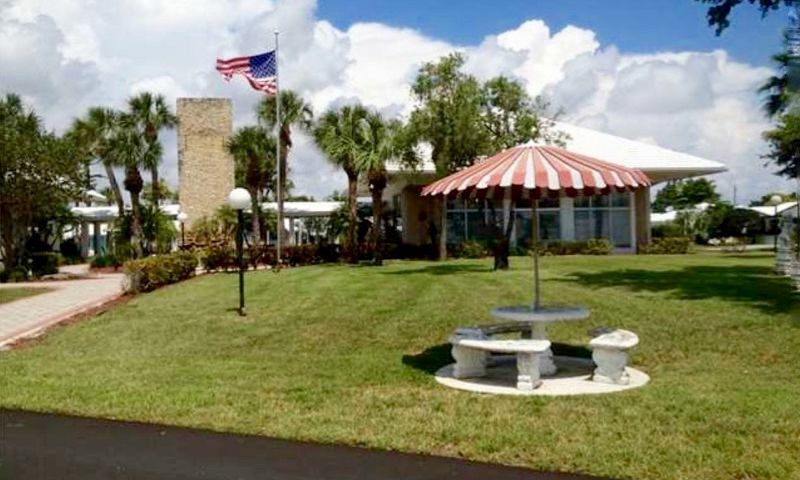 Leisureville is a 55+ community located in Pompano Beach, Florida. This active adult neighborhood consists of 928 residences available on a resale-only basis. Homeowners enjoy amenities from two clubhouses, community transit, plenty of social activities, and affordable low-maintenance homes. Residents will also love living in a convenient location within Broward County that allows them to be near attractions and shopping. Residents of Leisureville enjoy two clubhouses full of great amenities. The North Clubhouse features a fitness center and sauna that's great for homeowners looking to stay in shape without traveling far from home. It also has an arts and crafts studio, table tennis, library, billiards room, and multi-purpose room, which all make great social spaces. A golf pro shop is on-site to provide golfers with the latest gear. Just outside of the North Clubhouse lies an outdoor pool, patio, and six shuffleboard courts. Leisureville offers free play to all of the residents on its nine-hole course. Community transit is also available to take residents shopping, run errands, and quick trips around town. The South Clubhouse offers additional amenities to keep residents active and entertained as well. The South Clubhouse has a multi-purpose room, outdoor pool and patio, and five bocce ball courts. Leisureville is surrounded by walking and biking trails, open spaces, and scenic lakes and ponds that add natural beauty to this age-restricted community. Leisureville was built between 1961 and 1984 and consists of 928 residences. Active adult homebuyers can choose from resale condo units or single-family homes. Leisureville has an established homeowners' association (HOA) that handles exterior-home maintenance. The HOA fee also includes water and sewer, lawn care, access to amenities, and exterior house painting. There are 576 condo units in Leisureville. Condo units range in size from approximately 600 to 950 square feet. They typically have one or two bedrooms, one or two bathrooms, and designated parking lot spaces. Active adult homebuyers have a variety of single-family homes from which to choose. There are 352 detached residences and these homes offer about 874 to 1,710 square feet of living space. They have two or three bedrooms, one to three bathrooms, and an attached one or two-car garage or carport. Leisureville residents have an active and social lifestyle. Homeowners can participate in dancing lessons or exercise classes to stay healthy while having fun. They can play a variety of card games such as poker, pinochle, bridge or enjoy other games like dominoes, scrabble, bingo, and table tennis. Leisureville also offers a variety of organized groups like travel club, coffee club, and lunch bunch where neighbors can build lifelong friendships while sharing similar interests. Active adults in Leisureville will always have something that keeps them busy. Leisureville is located in Broward County, which offers plenty of attractions, shopping, dining, and is near Interstate 95. Residents can golf at Crystal Lake Country Club or Pompano Beach Municipal Golf Course. They can have some fun in the sun by visiting the many beaches along the Atlantic Coast. Medical facilities are close by like Broward Health, North Broward Hospital, and Premier Urgent Care. The area also provides plenty of shopping from grocery stores like D&R Market and Shop Smart to department stores like Macy's just a few minutes away. Long distance travel is convenient with Fort Lauderdale-Hollywood International Airport only 23 minutes away. Active adults will love everything Leisureville has to offer 55+ homebuyers in Pompano Beach, Florida. There are plenty of activities available in Leisureville. Here is a sample of some of the clubs, activities and classes offered here. There are 576 condo units in Leisureville. Condo units range in size from approximately 600 to 950 square feet of living space. They typically have one or two bedrooms, one or two bathrooms, and designated parking lot spaces. Please Note: Not all floor plans are available at this time. Active adult homebuyers have a variety of single-family homes from which to choose. There are 352 detached residences and these homes offer about 874 to 1,710 square feet. They have two or three bedrooms, one to three bathrooms, and an attached one or two-car garage or carport. Please Note: Floor plans are not available at this time. 55places.com is not affiliated with the developer(s) or homeowners association of Leisureville. The information you submit is distributed to a 55places.com Partner Agent, who is a licensed real estate agent. The information regarding Leisureville has not been verified or approved by the developer or homeowners association. Please verify all information prior to purchasing. 55places.com is not responsible for any errors regarding the information displayed on this website.